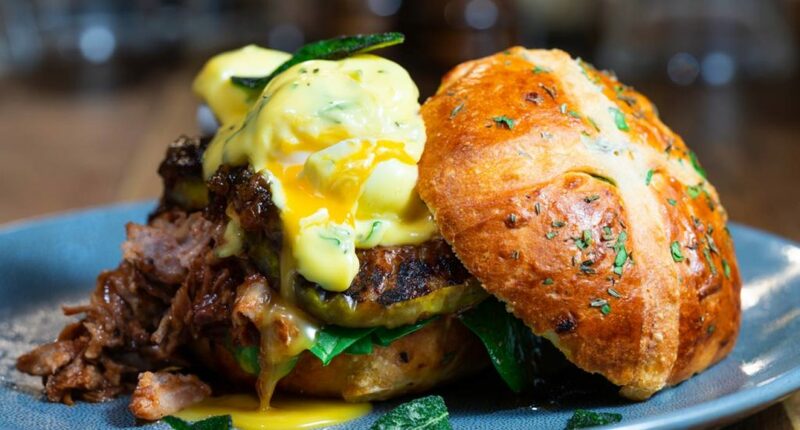 Foodie specials to try this Easter! Hit ‘em with the egg puns. There’s no doubt that you’re sick of hearing overused, unimaginative Easter-related yolks, which is why we’re just going to get straight to the point (why are you cringing?). 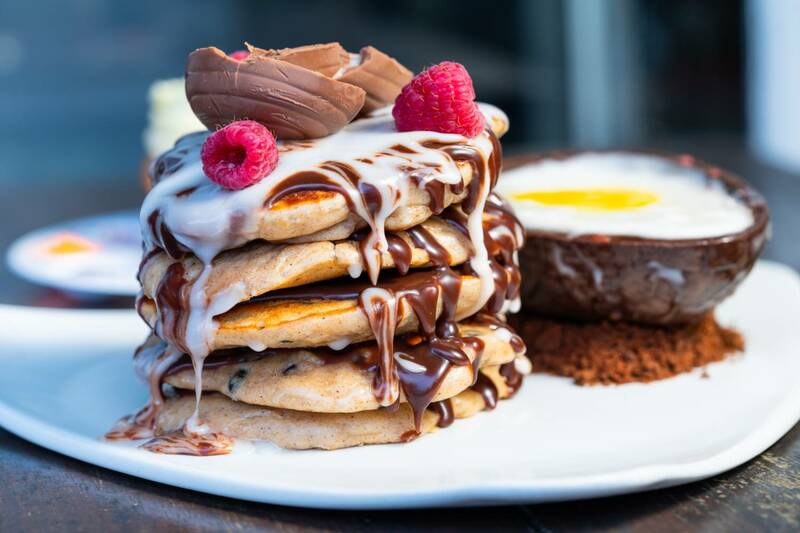 Here’s a round-up of Easter-inspired eats available until your favourite April holiday, with everything from Easter fries to gelato eggs putting a new spin on Easter feasting… and a delicious new hole in our wallets. Gimme those buns, hun. Chapter IV has created two foodie hybrids that will change your life. Tuck into the hot cross Benedict stacked with sticky BBQ pork, poached eggs, spinach and caramelised apple with an apple cider hollandaise held together by a warm sage and caramelised onion hot cross bun… then cinnamon, ginger, ricotta and currant hot cross cakes with a Creme Egg filling, milk chocolate ganache, plus a giant Creme Egg perfectly placed on a bed of chocolate soil. It’s a mouthful, but we can take it. We like our soldiers in the form of doughnut fries. 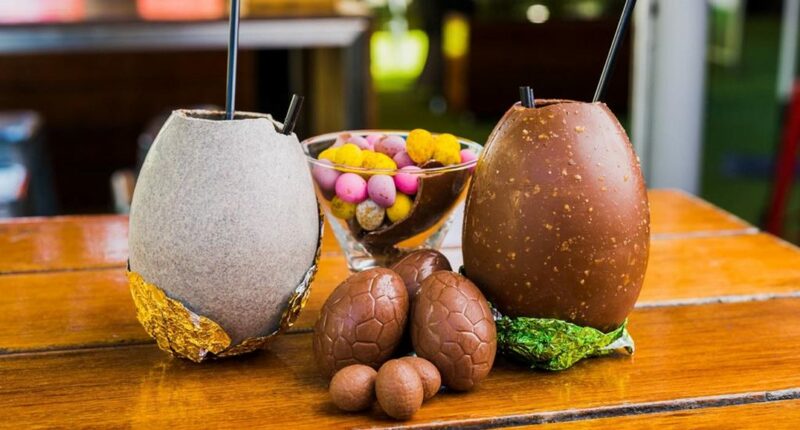 Brace these bad boys for a serious dipping, as Paddock Bakery’s Easter dippy eggs consist of two hollow chocolate eggs filled with white chocolate cheesecake and salted caramel yolk, with cookie crumb, malt chocolate crumble, fresh strawberries and marshmallows to add to the mix. Once you go Époque, you never go back. Putting a luxe twist on classic Easter treats, Belle Époque’s signature range of chocolate eggs are made from the finest Valrhona chocolate, uniquely hand-painted, and filled with a selection of hand-rolled truffles (the crack when you cut it open is SO satisfying). Moving onto cross boys, their hot cross bun features candied ginger, cranberry and Emporium tea-soaked sultanas, whilst the not cross bun is flavoured with Valrhona chocolate, candied orange and praline. So. Bougie. For those who keep their chocolate in the fridge. Get to Gelatissimo for smooth milk chocolate gelato with healthy swirls of creamy egg, and get as many scoops as you damn well please. How now Easter bunny bao? These sweet little pillows of heaven are almost too cute to eat, taking the form of pink and white Easter bunny heads stuffed with chocolate and served in threes. We’re betting that more than one serve won’t hurt. (Sugar) high, how are ya? Goldfinch has kicked off Easter sipping with a month-long offer of Belgian chocolate espresso martinis topped with gold leaf. When in Easter! Creme Egg… but make it Insta-worthy. Eat Street fave The Doughnut Bar has created the mother of all mashups, carving open a Cadbury choccy Easter egg, stuffing it with doughnut fries, and topping it with a creamy soft serve reminiscent of Creme Egg filling. I have to go now, my planet needs me. The Holy Trinity has arrived at Gelato Messina in the form of Lord Lamington, Saint Pistachio and Holy Hot Cross Bun gelato-based Easter eggs. Each egg is decked out with a heavenly blend of ingredients, such as the Holy Hot Cross Bun with real hot cross bun bits, a dulce de leche centre, and coated with a milk chocolate glaze. It’s going to be one silent night when the squad sits down to tuck into a few. Stick a fork in us, we are DONE. 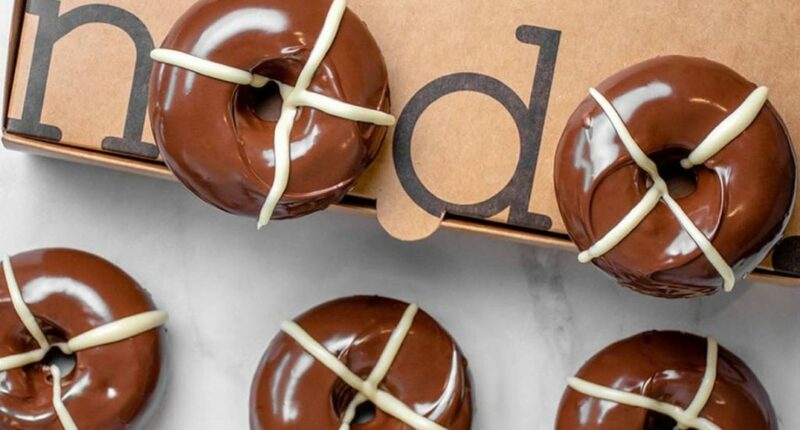 Every Easter, Nodo rolls out their iconic hot cross donut – gluten-free cinnamon-spiced wheels of joy with a chocolate glaze and white chocolate cross. You’ll only be cross if you miss out. Of course, you’re going to want to catch up with some classic favourites, and King Street Bakery is bringing home the best buns in Brisbane. Chuck on the kettle and heat up a couple of fruity bois from Bowen Hills’ hottest bakery, made better with a whole lot of love. Without context, half of an Easter egg sounds like half the fun, but with Jocelyn’s Provisions loaded take, it’s everything we need and more. Jocelyn’s ruby chocolate egg half is filled with ruby chocolate honeycomb, milk and dark chocolate raspberry drops, and plum and pistachio bark.